21 February 2017: New Delhi. Yusuf K Hamied, Chairman, Cipla has offered free knowhow for making the essential drugs in the public sector. Speaking at the Diamond Jubilee Foundation Day ceremony of All India Management Association (AIMA), which is also observed as the National Management Day, Hamied said that healthcare was a different business and it required different rules which prioritized human lives more than the profits. “No one should be denied medicine,” he said. Commenting on the government decision to fix stent prices, he said that the only way to have low prices was to have free competition. He pointed out that companies do not set prices based on cost but on value. He gave the example of a Hepatitis B drug that is sold for $84,000 for a year in the US because the insurance covers it and the same company is offering the same drug in India at $250 per year. “We should pay royalty to the scientists but should not allow monopoly,” he said. Receiving the AIMA Life Time Achievement in Management Award, Hamied promised the Cipla will continue to provide affordable and high-quality medicine in the future as well. “Health is a permanent crisis in India…It is very well to grow but we want a healthy India,” he said. Hamied also offered to share Cipla’s knowledge in CSR with other companies through AIMA and said that implementation is the biggest challenge in CSR. He pointed out that the last year’s CSR added up to only about Rs 9,000 crore whereas it should have been Rs 30,000 crore. 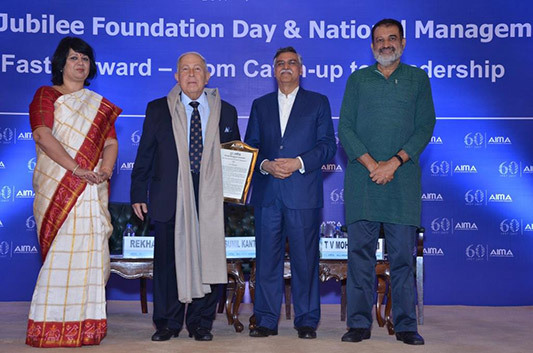 Sunil Kant Munjal, President, AIMA and Chairman, Hero Corporate Services lauded the contribution of Hamied to the country. Regarding CSR, he pointed out that the companies that had not used up their 2% quota on CSR had received notices from the government. He explained that many companies were taking long to launch CSR projects because they wanted to make massive impact. AIMA also honoured Bindeshwar Pathak, Founder, Sulabh International with its Public Service Excellence Award. The AIMA – JS Juneja Award for Innovation and Creativity in MSME sector was presented to Chemical Resources, an emerging nutraceuticals company. N Chandrasekaran, Chairman, Tata Sons, could not receive his AIMA - JRD Tata Corporate Leadership Award as he was taking office today. He will be presented his award at AIMA’s National Leadership Conclave on 22-23 March in Delhi. During the ceremony, AIMA announced the launch of 7 new management diploma programmes that will be delivered through the TCS’s digital collaborative learning platform, iON. This is a major initiative by AIMA towards digital education, said Munjal. Bindeshwar Pathak recounted that till the end of 1960s, the rural India had no toilets and he had been using toilet technology to achieve social inclusion of those who had been left out for 5,000 years. Commenting on the Swachch Bharat Abhiyan, Pathak said that though the government was spending billions on building toilets, people were not using those. “Implementation is the key,” he said. TV Mohandas Pai, Senior Vice President, AIMA and Chairman, Manipal Global School said that India’s biggest challenge was the rule of law. “There is a need to incentivize good, honest people,” he said. He pointed out that Rs 8 lakh crore of tax was stuck in litigation. He also stressed the need for changing the narrative about the country from mostly negative to celebrating Indian success stories. AIMA’s Foundation Day ceremony was attended by about 500 delegates including CEOs, management experts, academics and students.